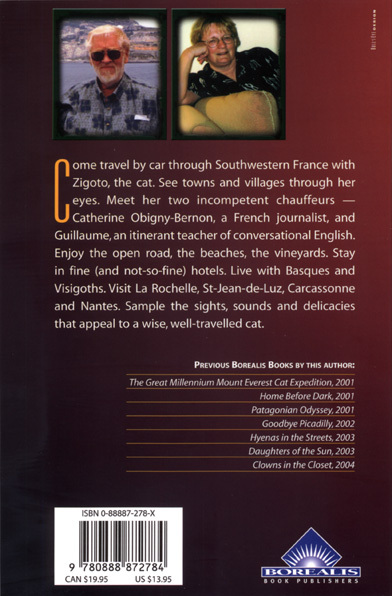 About the Book Come travel by car through southwestern France with Zigoto, the cat. See towns and villages though her eyes. Meet her two incompetent chauffers — Catherine Obigny-Bernon, a French journalist, and Guillaume, an itinerant teacher of conversational English. Enjoy the open road, the beaches, the vineyards. Stay in fine (and not-so-fine) hotels. Live with Basques and Visigoths. Visit La Rochelle, St-Jean-de-Luz, Carcassonne and Nantes. Sample the sights, sounds and delicacies that appeal to a wise, well-travelled cat.